The LRT or Edmonton Light Rail Transit, is a light rail system in Edmonton, Alberta. Operated by the Edmonton Transit System, this network is in operation for now over 35 years. With 2 lines, serving 18 stations a daily ridership of 108,690 (2015), it can be said it is indeed a popular means of public transportation. This 24.3 km long network is undergoing massive expansion work already, with further expansion to its Metro line and Capital line also proposed. Currently, the network consists of just 2 lines that serve 18 stations in total. The two lines are: Capital line and Metro line respectively. The Capital line runs between Clareview and Central Park stations, connecting northeast Edmonton to south Edmonton. The Metro line infact works between different terminals, on different days. From Monday-Saturday, it runs between NAIT and Century Park station and on Sundays as well as during the night time, it runs between NAIT and Health Sciences station. It connects Downtown with northwest Edmonton. The 18 stations that these two lines serve are: Clareview, Belvedere, Coliseum, Stadium, Churchill, Central, Bay/Enterprise Square, Corona, Grandin/Government Center, University, Health Sciences/Jubilee, Mckernan/Belgravia, South Campus/Fort Edmonton Park, Southgate, Century Park, NAIT, Kingsway/Royal Alex and MacEwan. The system currently operates one line which serves 15 stations, and runs between Clareview and Century Park stations. 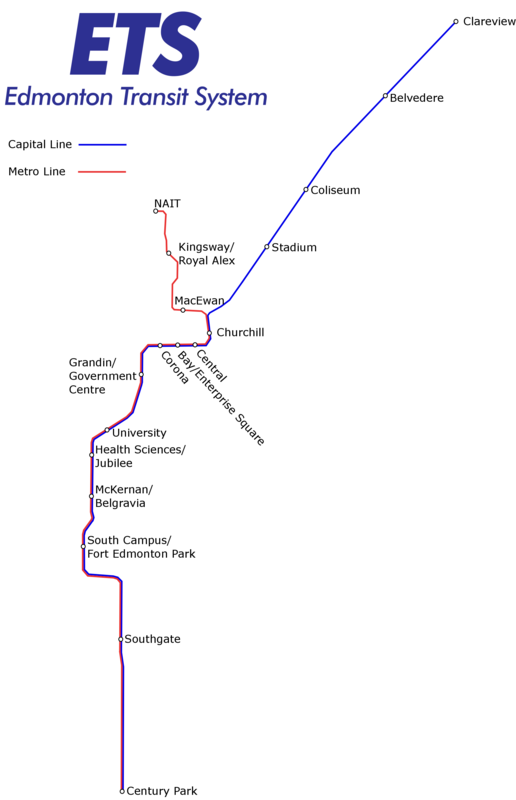 Map of Edmonton Light Rail Transit showing its line and stations. Click on the map to enlarge it or refer to the official maps here. The LRT runs everyday between sometime around 5:00 am till approximately 01:30 am, the next day. The frequency however, differs with the time of the day as well as the day. On weekdays during peak-hours the trains have a headway of about 5 minutes. During midday and Saturdays, the time interval between two trains is slightly longer of about 10 minutes. In the evenings and on Sundays, the waiting time is 15 minutes between each train. An adult single ticket can be purchased for $3.25. Tickets can also be purchased in packs. An Adult 10 Pack Ticket costs $24.75.Discounted tickets are also available for youths in the age group of 6-17 years, and senior citizens aged 65+ years. A Youth /Senior ticket pack of 10 tickets can be purchased for $21.50. Various passes are available for various kinds of passengers, each with its own merits and demerits. A Day Pass can be purchased for $9.25 and it allows for unlimited travel for one day for one adult and up to four children aged twelve years and under. An Adult Monthly Pass costs $91.50. Full time students of post- secondary institutions can obtain a Post -Secondary Monthly Pass for $83.50. A Youth Monthly Pass can be purchased for $69.00 for children aged between 6-17. (As of September 1st 2016,the price is going to increase to $71). A Senior Monthly Pass costs $14.50, this pass is exclusively for senior citizens aged 65+. AISH recipients can also get discounted rates with an AISH Monthly Pass that costs $35.00. A Senior Annual Pass costs $128.75 while a Senior Annual Pass- Low Income costs $55.75. Children five years and under can ride the system for free, provided they are travelling with a fare paying adult. Holders of CNIB ID can also travel free. The LRT posses great importance on the safety of its passengers. Communication devices are present in every station, should there be any emergency. Along with that, aboard the LRT trains there are several devices to alert the motorman of an emergency. Cameras are installed in all stations and major transit areas. To provide an extra sense of security, uniformed officers patrol the stations every day of the year. Park and ride facilities are given priority in Edmonton. They are available and coming up in whichever station, where such a facility is possible. Carpooling is something that is really being encouraged there. As of now, there are 3 stations that provide park and ride facilities exclusively for the one that carpool. To qualify as a carpool, there should be a minimum of one passenger along with the driver. The 3 stations are: Stadium LRT Station, Belvedere LRT Station and Clareview LRT Station.